Your knees are the largest joints in your body and connect the femur (the bone in the upper leg) to the tibia (the bone in the lower leg). As you can imagine, the knee takes a lot of pressure and plays a critical role in walking, standing still and holding up your body weight, balancing, running and even sitting still. It’s no surprise that knee pain and injury is one of the most common medical complaints from people of all ages. What may surprise you, however, is that the health of your feet can directly affect the health of your knees. Your feet support you and connect you to solid ground, and when your feet ache, itm can harm other parts of your body, especially your knees. Here are some common culprits that discourage healthy feet and knees, and smart strategies to combat them. Correct leg alignment and balance start with the right pair of shoes. Proper shoes can cushion the impact on your feet and knees from exercise and other strenuous activity, as well as keep your feet and knees properly aligned, especially when changing directions quickly. And while high heels are attractive, they raise your heels and alter your alignment. Your quadriceps have to work harder to keep you balanced, which can cause pressure on your knees and, ultimately, knee pain. Luckily, there are a wide variety of brands that focus on comfort and safety without sacrificing style and appearance. Make sure that both your everyday and workout shoes provide adequate support and protection from injury. Save the high heels for special occasions only. Inflammation and swelling around your joints and soft tissue are called arthritis. As with any swelling, your feet and ankles can feel stiff, uncomfortable, and even painful. Osteoarthritis, the most common form of arthritis, is the result of deterioration of the cartilage surrounding the joint, and usually occurs gradually over time. Foot and ankle arthritis will affect one (or all) of three areas: The heel bone where it connects to the inner or the outer foot bone; the joint where the ankle and the shinbone meet; or the intersection of the big toe and the foot. Arthritis in any of these locations will reduce your ability to move your foot naturally, and cause swelling, soreness and pain. As a result, your alignment and infrastructure are compromised, which can give rise to sore and injured knees as well. People have been getting foot massages for over 5000 years, and for a good reason. Massage enhances circulation, prevents injury and promotes faster recovery, reduces swelling and inflammation, and provides natural pain relief. While you can certainly give yourself a foot massage, there are some foot massagers on the market that make the process very simple. As a bonus, most massagers include reflexology benefits. Reflexology is the practice of gently applying pressure to your feet based on zones, called reflex areas, which removes toxins, reduces inflammation and cuts down substantially on pain. Whether you take advantage of the convenience of a foot massager or do it yourself, a massage incorporating reflexology is a smart way to alleviate the pain of foot arthritis and keep your knees healthy at the same time. Probably one of the most painful forms of arthritis in the foot is plantar fasciitis, which is an inflammation of the connective tissue along the sole of your foot. The swelling results in heel and arch pain, and feels very much like the arch of your foot has fallen. Plantar fasciitis makes simple walking a harrowing experience, and it is common for someone with the condition to try to compensate by changing their gait or putting more weight on the other foot. Obviously, this overcorrection affects not only the feet and ankles but your entire infrastructure, including your knees. While it can be tempting to stay off your feet when you are suffering from plantar fasciitis, moderate walking, combined with stretches and exercises are the best therapy for it. Make an effort to take a gentle walk each day, even if you can only stand a few minutes of the exercise. Also, commit to improving your foot’s resilience by flexing your foot and toes slowly back and forth and rolling your ankle when you first wake up and throughout the day. Rolling your foot over a tennis ball is another great way to gently stretch your foot without overdoing it and risking further injury. Feet that are not aligned properly can cause a chain reaction that affects other parts of your body, including your knees, especially when you move actively, such as in a brisk walk or run. The most common form of misalignment is overpronation, which is a condition where your heel rolls too far inward, creating a break in the transfer of energy to the knees and hips. That break causes the legs and knees to rotate inward as well. Overpronation can be identified by pain moving from the foot upward, especially after standing or walking for an extended period. Visually, you may see a bump sticking out on the inside of your foot, unusual calluses or swelling in the ankle or heel, or no visual arch to your foot. Proper rotation of the feet, which is not possible in an overpronated position, provide shock absorption to the entire lower body, as well as promotes good posture. It is clear that overpronation will frequently cause pain in other areas of the body, especially the knees. 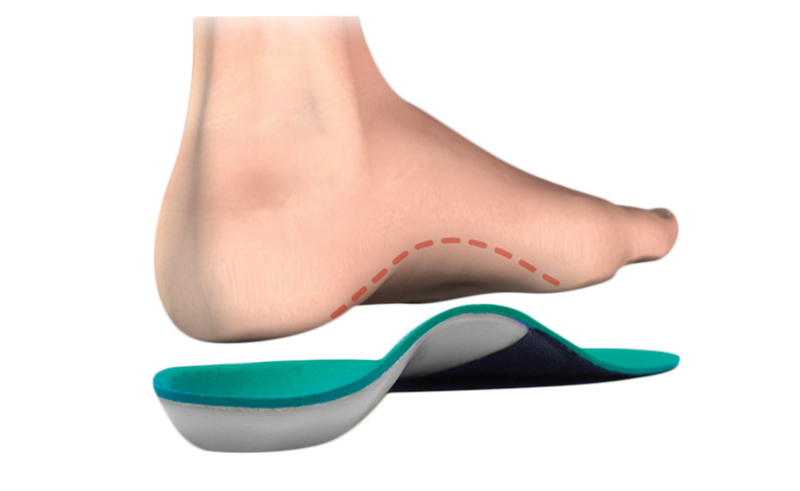 Foot orthotics, sometimes called orthotic technology, are a convenient and practical tool to correct your foot pronation. Custom made to your feet; they can support your arches and stabilize your heels to prevent the inward rolling of both your feet and your knees that occur when you overpronate. For many people, orthotics can help them feel more comfortable while standing and moving, and prevent further injury to their feet and knees. While each of the smart strategies works well for the particular condition noted above, the great news is that they will also positively benefit and help correct all of the other culprits of poor foot health as well. For example, while orthotics are an excellent choice to correct overpronation of the foot, they can also help to alleviate pain associated with foot and ankle arthritis. Pain from plantar fasciitis is relieved by a soothing foot massager in addition to the gentle exercises recommended. Your feet and ankles control the function of your entire body structure, including your knees. If there is a deficiency in the flexibility or function of your feet or ankles, that weakness will spread beyond your feet to your knees, back and hips. Healthy knees and bodies start with healthy feet. Start a smart strategy for your feet today.